Social network analysis and restoration experts will discuss how to strengthen community governance through mapping and data analysis at the local level and in online spaces like social media. Traditionally, forest and landscape restoration has been concerned with mapping the biophysical opportunities to plant trees and shrubs. But restoration is not just about trees. It's also about the people. WRI’s recent guidebook, Mapping Social Landscapes: A Guide to Identifying the Networks, Priorities, and Values of Restoration Actors, introduces a new focus for mapping: the people who live, work and depend on landscapes. By translating methodologies frequently used in the crisis fields of national security and health, the guide offers strategies to build a movement around restoration. To create an environment for successful restoration and natural resource management, we must understand where resources come from, who provides leadership and who are champions of the cause. This requires social network analysis, which can reveal central and peripheral actors and the strategies that are required to change or improve how people work together. 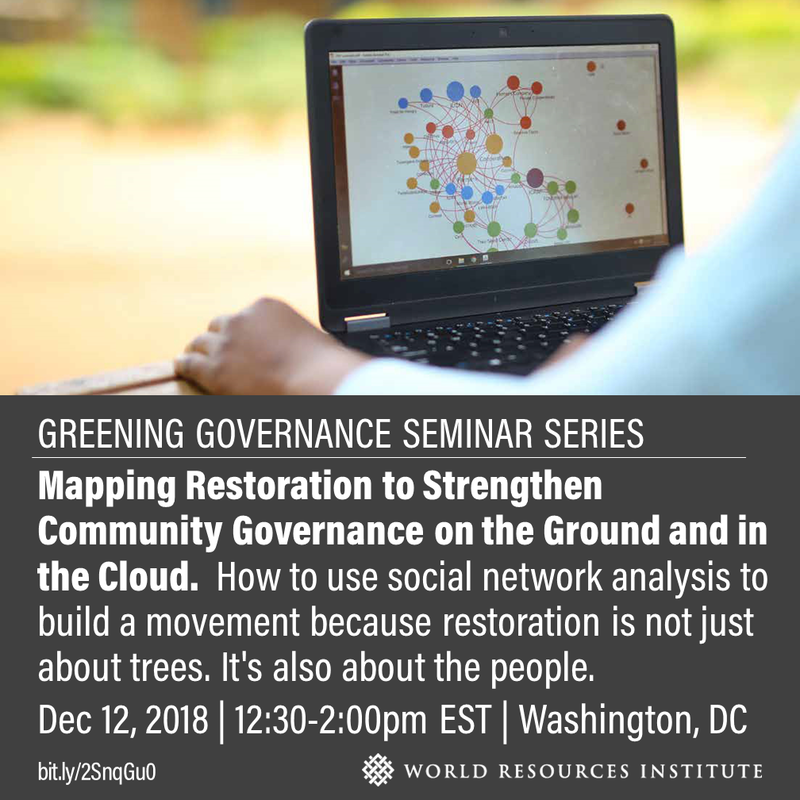 Join leading restoration and social network analysis experts to learn more about how to apply these techniques through participatory approaches and social media mining. WRI's Greening Governance Seminar Series bridges the divide between the governance and environmental communities to identify solutions that benefit people and the planet. Why do some environmental policies succeed in one country but fail in another? What will it take to transform the Paris Agreement’s ambitious commitments into actionable policies? How can decision-makers engage a range of stakeholders, from average citizens to Fortune 500 companies, to build support for policies that protect natural resources and the communities that depend on them? How can governments sustain this environmental action across election cycles? Many of the answers to these questions are, at heart, issues of governance. Increasing public participation in environmental decision-making can deepen civil society’s commitment to climate change mitigation and yield more equitable, effective policies. Enhancing government transparency equips communities with the information that they need to engage in these policy-making processes. Strengthening accountability frameworks helps ensure that governments make progress on their Paris Agreement emissions reduction targets. In short, good governance can improve climate and environmental outcomes. Yet the governance and climate communities continue to work in silos, conducting research and implementing programs that remain largely divorced from one another. WRI’s Greening Governance Seminar Series seeks to bridge this divide by bringing together leading experts from both fields to discuss the intersection of their work, the most pressing environmental governance issues at hand, and solutions that benefit people and the planet.